As I’m sure anyone who knows me is well-aware, I was a Batkid. Now firmly established in the realm of adulthood, I feel some vindication in knowing that the world has reached a general global consensus in acknowledging the truth: Batman is the Coolest Superhero. Sure, he might not be your favourite (for whatever godforsaken reason), but all must bow to the fact that he is indeed The Coolest. Batman has become an eternal symbol of cool. Just like leather jackets. And jazz. And smoking. And the Sixties. And smashing glasses of whiskey in fireplaces. Perhaps in a vain attempt to siphon off some of this cool, Boy Roommate and I decided to watch The Dark Knight. This led to a debate regarding the live-action Batman franchise(s). No. The debate was over Who is the Better Joker. This needed to be settled. But I murdered Bruce Wayne's parents. That evening, we watched Jack Nicholson do his thing. Neither opinion was swayed. If anything, opinions were only reinforced. We agreed to disagree. Again. So the other night, we decided to watch the original. That’s right: Batman: The Movie. From the automatically cool year 1966. Also, the way its subtitle so proudly claims itself to be The Movie does seem rather definitive. And this brought another Joker into the mix. 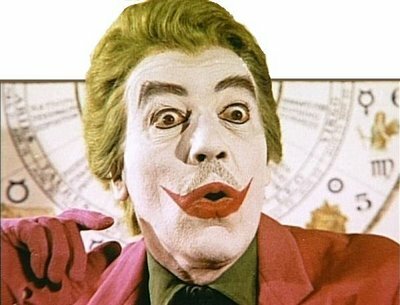 Cesar Romero. Okay, so The Joker stands out the least of all the villains in this film. The Penguin is the mastermind, Catwoman spends a lot of time trying to seduce Bruce Wayne, and The Riddler just minces around being awesome in his lavender cummerbund. You can see his moustache underneath his white makeup! But I can't even be bothered to shave! *Irony. Obvs. 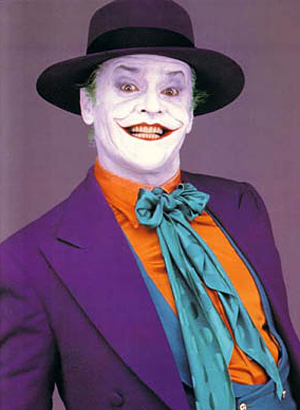 Everyone knows Michael Keaton is the best Batman. **I posited this question to Dad and he responded with “Heath Ledger, DUH!” But, to be fair, Dad loves Heath Ledger in a way that’s a little worrisome. A Knight’s Tale is his favourite movie; he owns it on DVD but it was still his first Bluray purchase. After Heath’s death, my sister and I had a troubled phone call over who would break the news to our father. 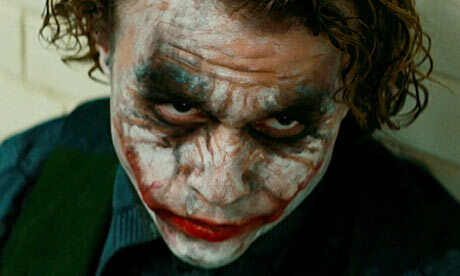 Dad also loves anything Batman, so, to him, The Joker combined with Heath Ledger is perhaps the single greatest feat of the performing arts. Author Ashleigh RajalaPosted on October 24, 2011 November 25, 2013 Categories writing about movies... and books... and tvTags batman, roommatesLeave a comment on have you ever danced with the devil in the pale moonlight? I know it’s been a while, but somehow, summing up the last few days of my life is remarkably similar to summing up the last month. Invited over for dinner with the parents on Thursday. I had been thinking this was rather sweet of them, since there wasn’t anything like Glee that week to unite us as a family. Anyway. Long story = short: they were babysitting for The Boy and The Boy’s Sequel*. There was a lots of cuteness and lots of crying. The Boy wept like a tempest over the fact that we paused “Poke-In-Oh”** for dinner. While the kids cried, Dad excitedly announced in an exercise in randomness that he was going to the zoo. I returned to The Commune at ten at night with baby spit-up all over my blouse and a bit of a headache. On Friday, got to see The Oatmeal. That was fun. But also, this was the day Dad went on his field trip to The Zoo. 1.) My sister, Bri, is a zookeeper at said zoo. (And apparently a damned-good one; she was Employee of the Month). 2.) Dad and his colleagues did not actually take any students on this field trip. While A Day at the Zoo sounds like a lost Marx Brothers film, I was told there were no mutes, outlandish Italian accents, or witty one-liners amongst their party. Met with Mum for lunch on Saturday. She meant A Feast for Crows, which she’s arrived at rather rapidly following her enthusiastic response to Sean Bean HBO’s Game of Thrones. Mum sipped at her apple cider. The rain was beating down on the plastic roof because we were at a pub and we tried to sneak in my fifteen-year-old cousin but pretty soon the jig was up and they sat us on the patio. “Um, what?” My natural reaction was shock, obviously. Called Dad on Sunday to verify the cobra story. Maybe it was like a Marx Brother’s film after all. *The Boy’s Sequel is two months old and looks so much like Orson Welles it’s a little unnerving.